This afghan pattern has a bit of lace, but is solid enough to provide lots of warmth and comfort on those cold winter days and nights. It works up quick too! You will need a worsted weight yarn and an H crochet hook, or a sport weight yarn and an F crochet hook. 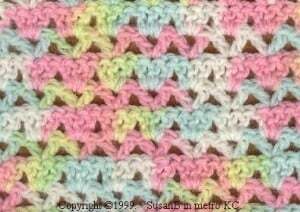 If you enjoyed this free crochet pattern you might also enjoy more designs by Handcrafting With Love.